Beirut (AFP) - Thousands of Syrians braved the freezing cold at Turkey's border after fleeing a regime assault that threatens a new humanitarian disaster, as Damascus warned Riyadh and Ankara not to send in troops. The government said any uninvited foreign soldiers who enter Syria would go home "in a wooden coffin", following reports that Saudi Arabia and Turkey, which support rebel forces, could deploy troops. 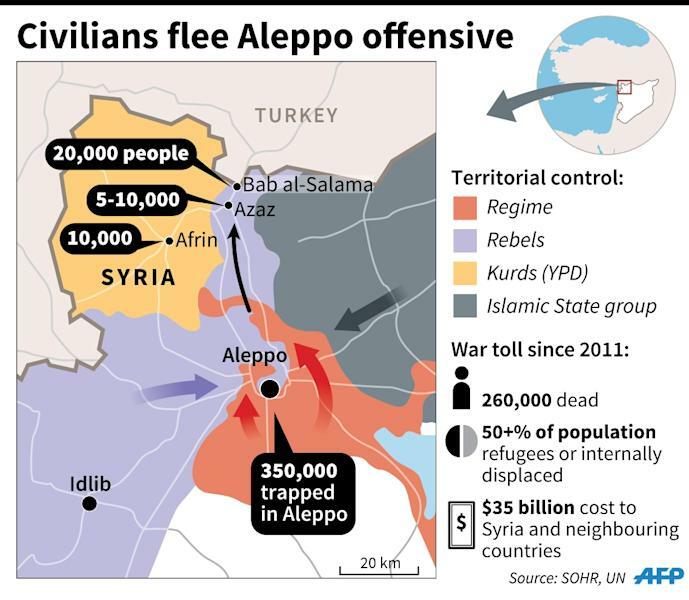 Tens of thousands of people have fled fierce fighting as government forces backed by Russian air strikes advanced this week against rebels, severing the opposition's main supply route into the northern metropolis of Aleppo. Turkey's Oncupinar border crossing, which faces Bab al-Salama inside Syria, remained closed Saturday, an AFP correspondent said. 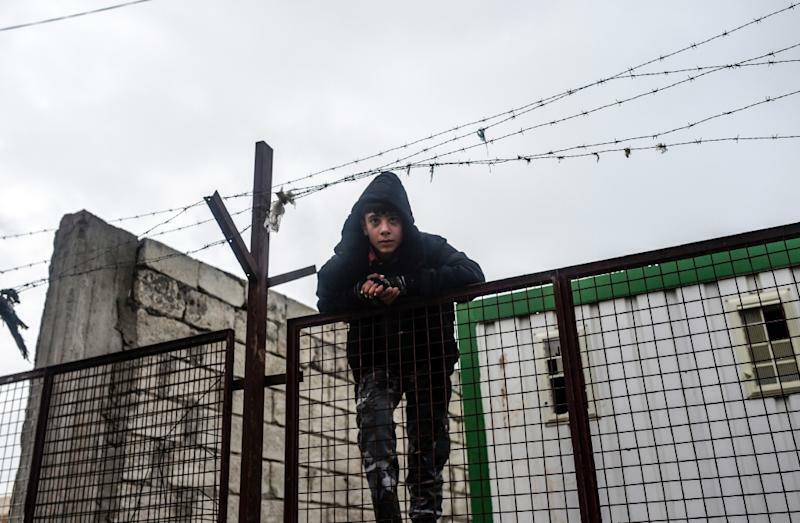 The United Nations said some 20,000 people had gathered at Bab al-Salama but the governor of Turkey's Kilis border province, Suleyman Tapsiz, said at least 70,000 may head for the frontier. Tapsiz said the displaced were being accommodated in eight camps on the Syrian side and that Turkey -- already home to 2-2.5 million Syrians -- was also able to take care of 30-35,000 refugees inside Syria. "We have received already 5,000 of them; another 50,000 to 55,000 are on their way and we cannot leave them there." According to the Britain-based Syrian Observatory for Human Rights, around 40,000 Syrian civilians have fled the regime offensive. The Observatory said 435 people have been killed since the regime offensive began on Monday, including 71 civilians, most of whom had died in Russian air strikes. Riyadh on Thursday said it would "contribute positively" if the US-led coalition against the Islamic State (IS) jihadist group in Syria decides on ground action. Russia, a key ally of the Damascus government, accused Turkey of "preparations for an armed invasion" of Syria, a claim that Ankara dismissed. The head of the elite Revolutionary Guards of Iran, another key Syrian regime ally, mockingly said Saudi Arabia would not dare send in ground forces. Turkey last faced such an influx in 2014 when 200,000 refugees fled the Syrian Kurdish town of Kobane over three days as IS and Kurdish fighters battled for control of it. 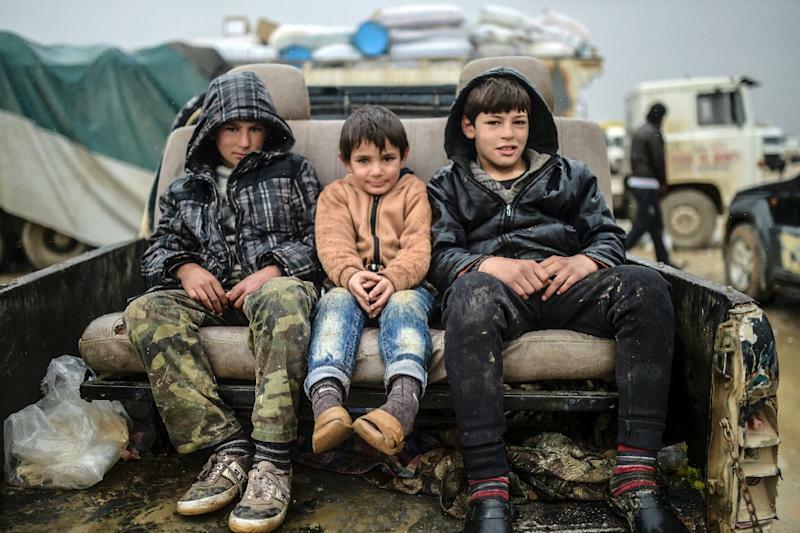 More than 260,000 people have been killed in Syria's conflict and more than half the population has been displaced. Also on Saturday, the mother of President Bashar al-Assad, Anissa Makhlouf al-Assad, died at the age of 86, state media reported. She was the widow of president Hafez al-Assad, who ruled the country with an iron fist, but she kept a low profile and was rarely mentioned in the media when her husband was in power or during the country's nearly five-year war.